Internalization of an external lookup table creates an internal copy of the lookup table within the graph. To internalize any linked external (shared) lookup table file into internal lookup table, right-clicking such external (shared) lookup table items in the Outline pane and select Internalize connection from the context menu. 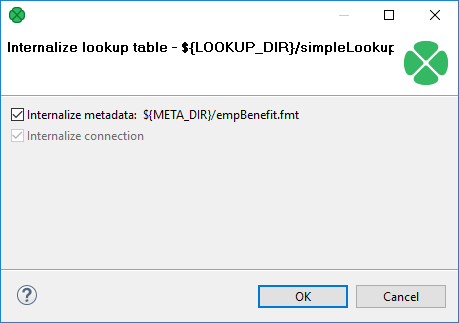 After that, the following wizard opens which allows you to internalize metadata assigned to the lookup table and/or its DB connection (in the case of Database lookup table). The internalization of metadata or datatabase connection is optional, the internal lookup table can work with external metadata or database connection. After that, the selected linked external (shared) lookup table items disappear from the Outline pane Lookups group, but at the same location, newly created internal lookup table items appear. If you have also decided to internalize the linked external (shared) metadata assigned to the lookup table, their item is converted to internal metadata item which can be seen in the Metadata group of the Outline pane. However, the original external (shared) lookup table file still remains to exist in the lookup subdirectory. You can see it in this folder in the Navigator pane. You can even internalize multiple linked external (shared) lookup table files at once. To do this, select the desired linked external (shared) lookup table items in the Outline pane. After that, you only need to repeat the process described above for each selected lookup table. You can select adjacent items when you press Shift and press the Down Cursor or the Up Cursor key. If you want to select non-adjacent items, use Ctrl+Click at each of the desired items instead.